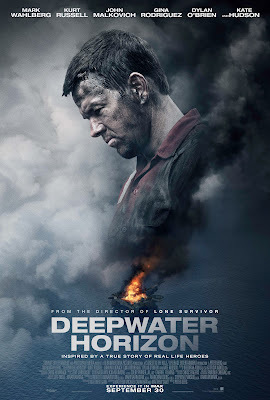 The new disaster flick about the 2010 Deepwater Horizon drilling rig explosion (which also caused a humongous oil spill in the Gulf of Mexico); the catastrophe is the largest environmental disaster in U.S. history (which also killed 11 workers, and injured 17 more). The movie stars Mark Wahlberg, Kurt Russell, Gina Rodriguez, Dylan O'Brien, John Malkovich, Kate Hudson and Ethan Suplee. It was directed by Peter Berg; who's also teamed with Wahlberg on the 2013 war film 'LONE SURVIVOR', and the upcoming historical disaster flick 'PATRIOTS DAY'. The script was written by Matthew Sand and Matthew Michael Carnahan; it was based on the The New York Times' article 'Deepwater Horizon's Final Hours' (written by David Barstow, David S. Rohde and Stephanie Saul). Due to it's $156 million budget, the film is a pretty big disappointment at the Box Office; but it has done well with critics. I'd say it's about as good a film as I expected it to be. The true story takes place on April 20, 2010; on the oil rig Deepwater Horizon (about 40 miles from the Louisiana coast). The drilling unit was owned by Transocean, and drilling for BP. The blowout, and explosion (on the rig that day), caused it to burn and sink; and release thousands of gallons of oil into the Gulf of Mexico. This film focuses on some of the 120 crew members, that were on board; including Mike Williams (Wahlberg), Jimmy Harrell (Russell), Andrea Fleytas (Rodriguez) and Caleb Holloway (O'Brien). The film is technically impressive, and it's well made. Berg is a talented director, at making this type of movie, and Wahlberg and Russell are great at acting in them. Although the performances are good, I don't think there's enough character development to really care about the characters. So the movie is not nearly as emotional as it wants to be. I also think spending $156 million on a film like this is ridiculous; how did the producers ever think they were going to make their money back?! It is intense, and suspenseful though.